The MyKronoz ZeTime Petite is a compact smartwatch that stands out from the crowd, thanks to its real hands. Only time well tell, though, if this analog/digital mashup is the future of the smartwatch. The MyKronoz ZeTime started life as something of a Kickstarter darling. Badging itself as the world's first smartwatch/real watch hybrid, it tries to marry the analog features of a normal watch - real hands! - and the digital features that we've come accustomed to with a smartwatch. The concept was certainly a hit with those who backed it on Kickstarter - originally it used the crowd-funding site back in 2017 to raise $50,000. It went on to amass over $5 million. That's 26,000 backers eager to see the ZeTime come to life. Skip to 2018 and there are now two size variants of the watch MyKronoz ZeTime: Regular and Petite. We spent some time with the Regular at CES and now we've had time with the MyKronoz ZeTime Petite at MWC 2018. The MyKronoz ZeTime Petite is a small-form smartwatch that will definitely suit those with smaller wrists. While the regular ZeTime measures 44 x 12.8mm and weighs in at 90g, the Petite is 39 x 12.6mm and 80g. The smaller form factor means that the display has shrunk, too. The Regular features a 1.22-inch screen, while the Petite is 1.05-inches in size - both have the same 240 x 240 resolution. While this does mean there's less real estate to deal with, so apps do look a little cramped, the inclusion of a rotating crown means that scrolling is manageable and actually preferable to swiping the small display. The small size also means that text is smaller on the screen, so if your vision isn't the best then you may struggle to read what's written. Saying that, the smaller bezel did look great on our wrists and aesthetically we actually preferred it to its bigger bedfellow. When it comes to the straps, these are also slightly smaller than those used by the MyKronos ZeTime Regular - 22mm (Regular) compared to 18mm (Petite). We had a few goes with popping the straps off and on - there's a variety to chose from, including sports, leather ones (dubbed Premium) and milanese (dubbed Elite). You shouldn't have too much trouble swapping them out, it took no longer than a minute for us. Despite the smaller size, the features of the ZeTime Petite are the same as the Regular version and that includes the size of the battery, which is 180mAh. According to MyKronoz this battery life should mean that the watch will last for a couple of days on a charge - we're guessing if you don't make use of the myriad sensors - but even when the screen goes out the analog watch hands will continue to work for a further 30 days. So if you were really lazy, and aren't fussed with the 'smart' aspect of the watch you could just charge once a month. That would be silly but the offer is there. Interestingly, because of the analog hands the OS powering the device is not Android Wear. This is our biggest bugbear with the MyKronoz ZeTime Petite. Android Wear has a wealth of apps, customization and is a well-recognised platform in the wearable world. MyKronoz' workaround is its own proprietary OS which has specially coded software that works with the analog hands. In some ways, this works really well. We checked a message on the ZeTime Petite and watched as the hands shifted themselves automatically to the 9:15 position. This meant that they fit into a specially designed line so they weren't in the way of the message we were reading. It's a smart bit of functionality. But it also means that the app choice is a lot more limited. Those familiar with Android Wear will have no problems navigating through the watch, however. You still swipe up for notifications, down for settings and left and right to see your daily goals etc. There are also third-party watch faces available. There's is also a companion app for both iOS and Android. This allows the ZeTime to be compatible across both Google's and Apple's devices. 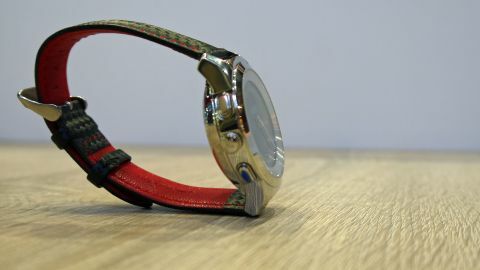 It didn't feel quite as slick as Android Wear, though, and we did get confused a few times with the manual buttons on the side as they both seemed to do the same thing: get us to the menu area of the watch. Tracking wise, you aren't short of options - there's everything from calorie counters, to heart rate to sleep tracking on board. The MyKronoz ZeTime Petite is a smart-looking smartwatch that boasts a number of enticing features. The biggest of those is undoubtably the merging of Swiss-made watch architecture with smarts. While it doesn't feel like it's managed this marriage perfectly, it's great to see a company trying something new and the the smaller screen doesn't do anything to diminish the experience.